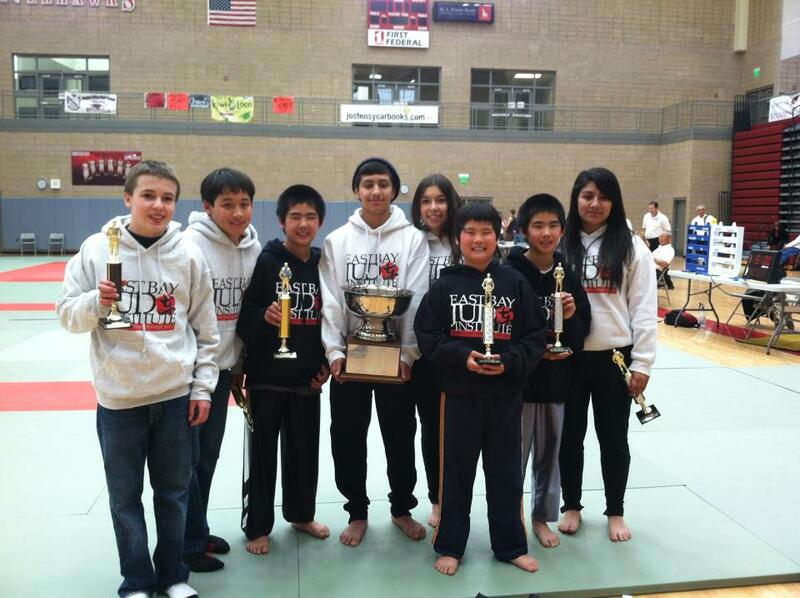 EBJI » 7 Competitors, 7 Medals in Twin Falls, Idaho! You are Here:EBJI >> News >> 7 Competitors, 7 Medals in Twin Falls, Idaho! 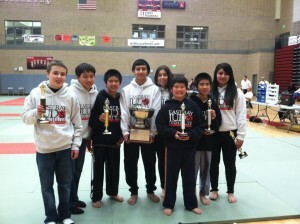 Comments Off on 7 Competitors, 7 Medals in Twin Falls, Idaho! EBJI members made their second annual trip to Twin Falls, Idaho this past weekend to compete at the CSI Judo Championships. Estefany Gonzalez (15), Ociane Canadas (17), Nathan Canadas (13), Nico Gonzalez (13), Nick Wood (12), Sato Matsumoto (12), Masa Matsumoto (12) and Taka Matsumoto (10) traveled with coaches Ken Kokka Sensei and Sayaka Matsumoto Sensei on April 6, 2012. The group left SFO on an early morning flight to Boise and were greeted by 2012 London Olympic Referee Robert Fukuda and his wife Terry. They drove 2 hours to Haegerman Farm where they enjoyed an afternoon of fishing with other Daiheigen Members. On Saturday April 7, seven of the eight athletes competed in the tournament. Estefany Gonzalez had to sit out due to a fractured toe. Nico Gonzalez led the way for team EBJI winning 7 of his 8 matches by ippon (full point). Nico competed in the 13-14 year old boys division and took first. He also competed in the 15-16 year old boys division and took second place. His efforts earned him the Most Outstanding Junior Judoka Award of the tournament. Nick Wood and Sato Matsumoto also took gold medals in their divisions. Nick went 2-0 in the 11-12 year old division and Sato went 4-0 winning all his matches by ippon. Masa Matsumoto and Taka Matsumoto each picked up silver medals, with only one loss each. Masa, who was in the same pool as his twin brother Sato, won a tough first round by decision and his other two matches by ippon. Taka also won his three matches by ippon. Nathan Canadas and Ociane Canadas also competed at the tournament. Nathan took third place in his division while Ociane won several matches but did not place. This was Ociane’s first tournament since injuring her shoulder last year. She had not competed since the 2011 Junior Nationals last summer. Everyone had a fantastic time and represented the dojo well. Special thanks to Mr. Bryan Matsuoka, and Mr. and Mrs. Robert Fukuda for their hospitality! Estefany, Nico, Sato, and Nathan now all turn their attention to the 2012 USJF Junior Nationals this upcoming summer in Spokane, Washington.